For your iPad classroom, there are thousands of educational apps to choose among some designed for the iPad, some for the iPhone. Both iPad and iPhone educational apps will work on your classroom iPads, but they work differently. iPhone (iPod touch) apps: These apps were designed for the smaller screen space of an iPhone, but they can be used on iPads too. What you have to remember is that their native resolution (just a fancy way of saying screen size) will be the same on an iPad, but they will appear to be relatively small on the larger iPad display. 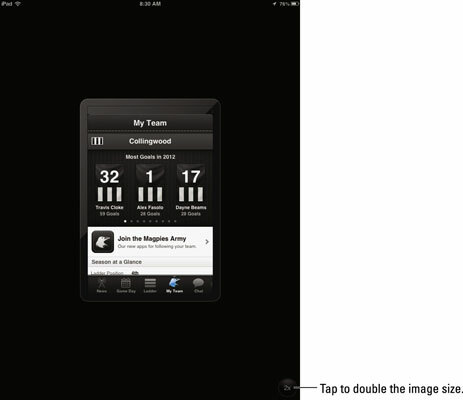 iPad apps: The interface on apps designed for the iPad takes full advantage of the complete iPad display area. Hybrid apps: Hybrid apps are denoted by a little + sign on the app icon and will automatically adjust to the resolution of your device. In other words, the same app that works on the smaller iPhone screen will also expand to take advantage of the full iPad display. Resolution, pixels, and other mumbo jumbo: You just want to know which apps to use. Well, here’s the scoop on iPhone versus iPad apps. It’s like the difference between watching your favorite movie on a 27-inch television in the bedroom versus watching that movie at a theater. To quote an old cliché, size does matter. iPhone apps have 480×320 pixel resolution. Apps designed for iPhone 4 or later have 960×480 pixel resolution. iPad 1 and iPad 2 apps have 1024×768 pixel resolution. Apps designed for the third-generation iPad have an amazingly crisp resolution of 2048×1536 pixels. Remember that hybrid apps that can adjust their display according to the device they detect. Some apps are available in both iPhone and iPad versions. In those cases, always select the iPad app, of course. Many publishers will allow you to download the iPhone version free if you have both an iPhone and an iPad and have paid for the iPad-based version. In some cases, however, the app you really want may have been designed only for the iPhone. For example, suppose you’re an avid follower of Australian football. Chances are, the app you use to follow games “down under” may only be available as an iPhone app. Don’t fret though, because you can still use it on your iPad. It just displays in its smaller native resolution. You can tap the little 2x button in the bottom corner, and the display doubles in size to fill the iPad screen. Be aware, however, that this doesn’t increase the pixel resolution of the app. It’s just displaying that resolution over the entire screen. It looks fine in most cases. It’s never as sharp as an iPad app, but really, what’s a guy to do when you need the football scores from Australia? You can access the App Store on your iPad or on your computer. In both cases, you need an Internet connection and that all-important iTunes account. Apps that are purchased on your computer will be transferred to your iPad the next time you sync them. Have you ever tried walking into a bank where nobody knows you and cashing a check without your ID? You’ll get the same cold shoulder in the App Store if you don’t have your user ID and password. Make sure that you’ve signed up for an Apple ID, or you won’t be able to download any apps.